On Friday 13th March its Comic Relief (Red Nose Day). 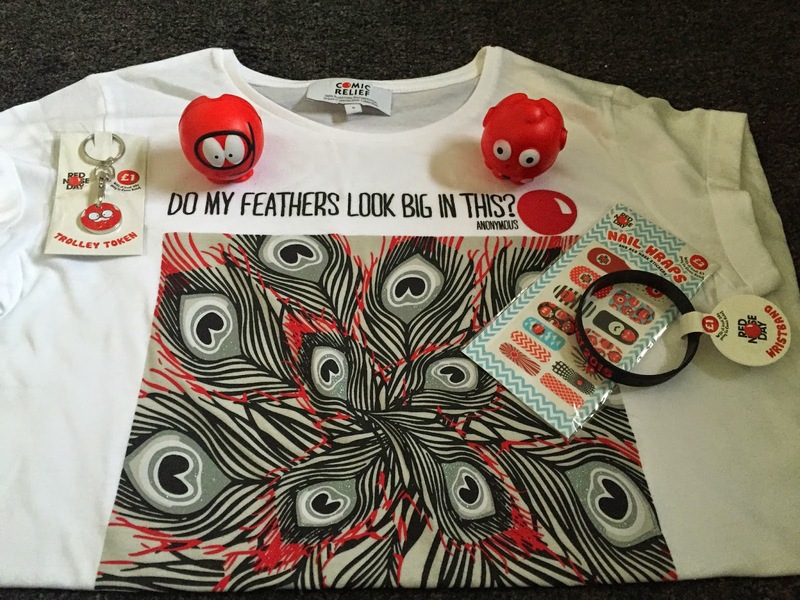 I thought I would share with you a few things that I bought to support Comic Relief. Comic Relief is a fantastic charity which aims are to “bring about positive and lasting change in the lives of poor and disadvantaged people, which we believe requires investing in work that addresses people’s immediate needs as well as tackling the root causes of poverty & injustice”. I bought most of the items from the BBC shop https://shop.rednoseday.com/merchandise. I also bought items from ASDA & Superdrug. The main shops you can buy Comic Relief goodies are from Sainsburys & you can get T-Shirts from TK Maxx. 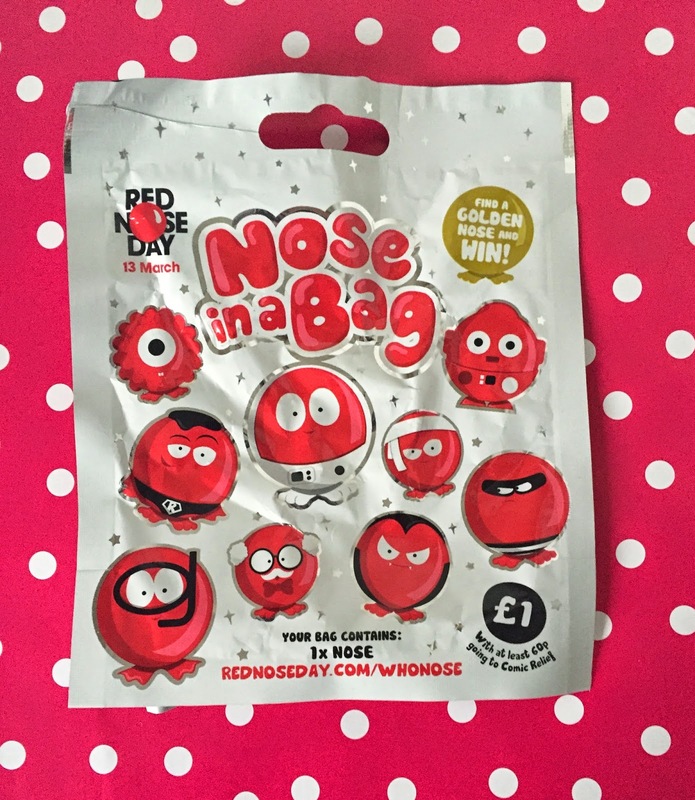 This year the Red Noses are in a bag, so when you open the bag its a surprise on what nose you get. There is also a chance that you win a prize too!!! Thats if you find one of the golden noses. I think the prize is that you get to go to the BBC studios on the 13th March & you get to be in the audience on Red Nose day. This year there are nine noses to collect. This is the 1st year I have managed to get a Red Nose to support comic relief. Normally when I go in Sainsbury’s every year they are always sold out. This year I ordered Comic Relief merchandise on the BBC shop. I ordered two Red Noses this year because of trying to find the golden nose. 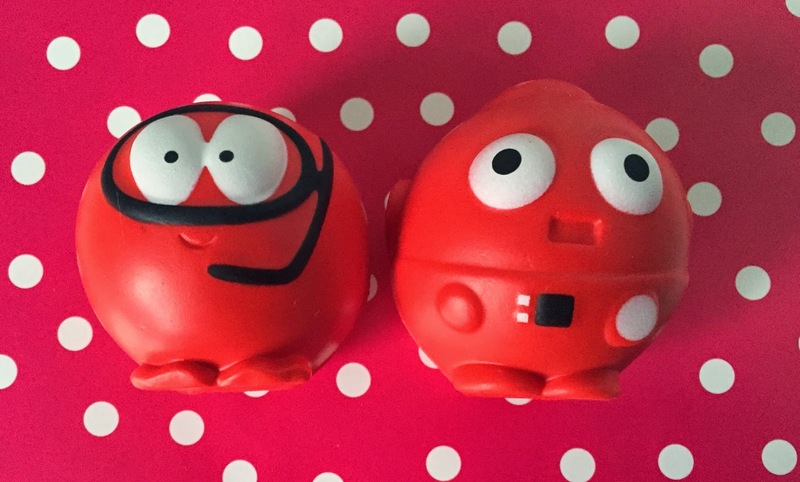 The red noses cost £1 each & at least 60p from the sales goes to the Comic Relief charity. My favourite Comic Relief merchandise is the designer T-shirts. I think there is five different designer T-shirts this year. 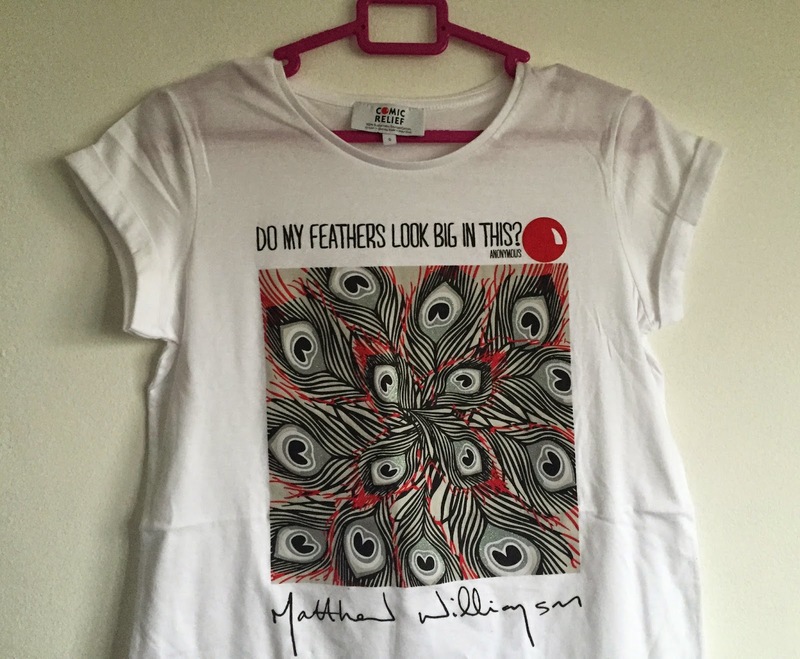 The T-shirt I got was designed by Matthew Williamson. The other designers are Karl Lagerfeld, Anya Hindmarch, Henry Holland & Diane Von Furstenberg. The T-shirt I got cost £14.99 & At least £8 goes to Comic Relief. Some of the other T-shirts vary in price from £9.99-£14.99 depending on what designer T-shirt you choose. TK Maxx sell the T-shirts & you can also get them from the BBC online shop. I got the Red Nose Day trolley token, because I thought it would be handy to put on my keyring & the money from the sale goes to charity which makes it even better. The trolley token cost £1 & at least 50p goes to Red Nose Day charity. 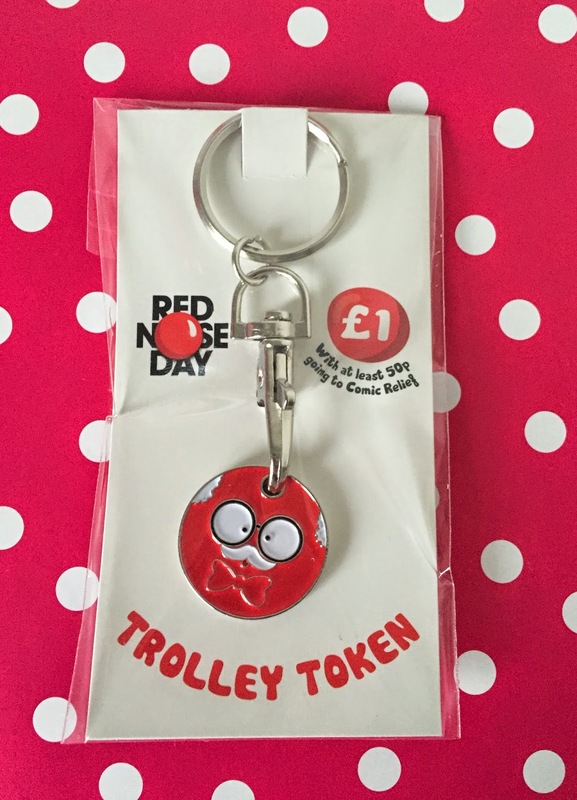 Next time I go shopping I won’t need to rummage through my handbag trying to find a £1 for a shopping trolley, because I now have the Red Nose Day trolley token on my key ring. 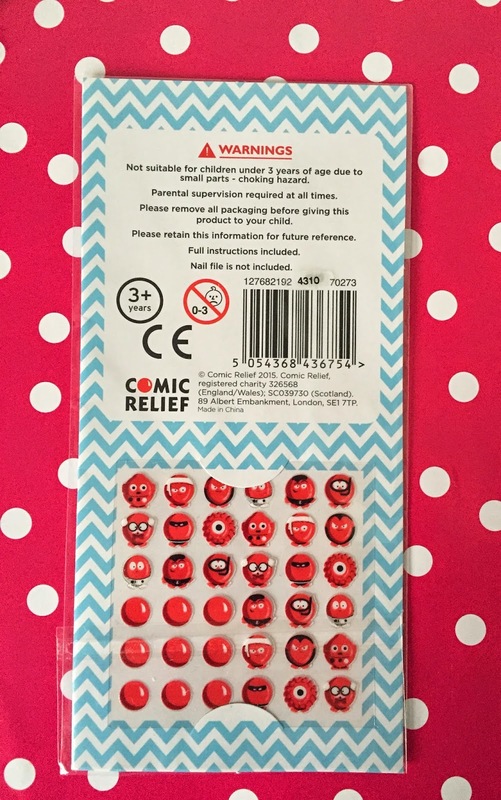 I love everything to do with nail art, so I was really pleased that Red Nose day have released nail wraps & stickers. 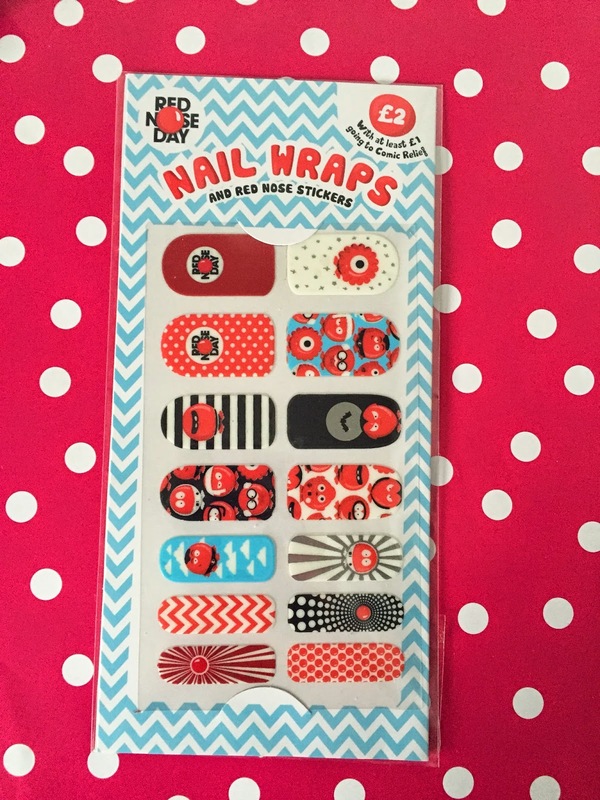 The nail wraps & stickers cost £2 & at least £1 goes to the Red Nose Day charity. The only downside to the nail wraps is that they don’t include a nail file, so if you buy the nail wraps make sure you have a nail file before you use them. I have already tried out the nail wraps & I am going to purchase another set of the nail wraps a few days before Red Nose day. I was really impressed on how good the nail wraps was. They were really easy to apply & lasted on my nails for about a week before they started to peel off. I applied a top coat of clear nail polish over mine to try to make them last longer but I think I didn’t really need to do that. As they stuck to my nails really well without a clear coat of nail polish. I think the Red Nose Day nail wraps are better than some of the branded nail wraps I have tried. 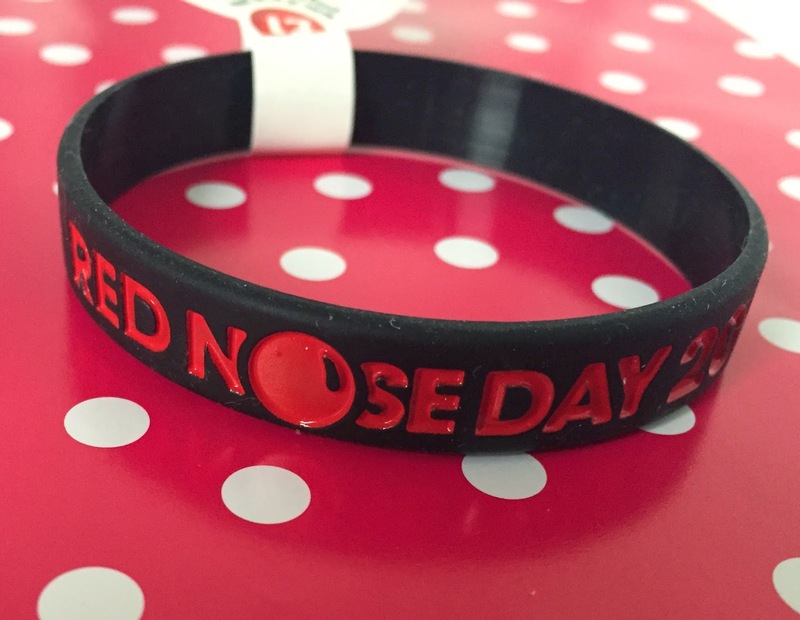 Every time Its Red Nose Day or Children In need I always buy a charity wristband. I love collecting Charity wristbands. 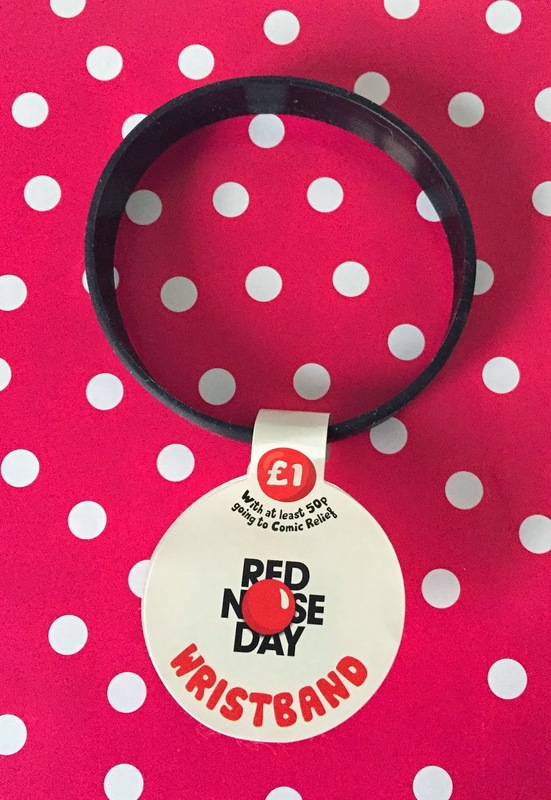 The Red Nose Day wristband cost £1 & at least 50p goes to the charity. The Wristband comes in two colours either Black or Red. You can buy the charity wristbands from Sainsburys or the BBC online shop. There is so many different products to choose from this year to support Comic Relief. Some of the other products are pin badge, hairband, umbrella, air freshener, mug, cake decoration kit, pens, red nose for your car, great Comic Relief bake off recipe book, sparkle badge, bake off apron, kids T-shirts, Teapot & a Lulu Guinness bag. The Lulu Guinness tote bag is exclusive to Sainsburys & its only £5!!!! I really want to try & find one of the tote bags. There are 3 Lulu Guinness bags to choose from.